The Right Reverend Gerald William Kinghorn, Bishop of Fencaster, is going through his correspondence one January afternoon when his much-harassed chaplain brings him the card of one Reverend Jonathan Derby who is waiting for the bishop to grant him an audience. At first, the name means nothing to the Bishop and then he recalls that earlier as Master of Satterthwaite College, a leading public school, he had the Denby cousins as his students. One of them - Denby Major - Henry, has now become a cabinet minister. This is apparently the other one - Denby Minor. Glad to reacquaint himself with a former pupil, the bishop settles to have tea with Jonathan who tells him that he has recently been demobilized from the RAF where he had been serving as a chaplain in the Middle East. Now he wants to know whether the Bishop has any vacant posts in his diocese. He wants a living in this part of the country because of his interest in early Saxon history. The Bishop has one such place, a remote and inaccessible village called Clynde near the marshes, a place that has been without a rector for so long that the Bishop worries the villagers have reverted to Paganism. Young Denby is immediately eager to take up the challenge. However, there are problems. For one, the patron of the parish, Lord Mundesley is a little fussy about whom to offer the rectorate, secondly the village is lonely and desolate, thirdly the stipend is a mere pittance, and most-importantly the rectory is supposed to be haunted. However, Denby is undeterred. The isolation of the village doesn't matter to him; his father, Sir Ambrose, has settled a generous amount upon him so money is no problem; he also does not believe in the matter of ghosts; as for Lord Mundesley, his father knows him and perhaps can persuade him to give Jonathan a chance. And this is what happens. Because of his high regard for Sir Ambrose, Lord Mundesley agrees to give Jonathan the post but he insists that the latter would not live in the rectory - it being not only too rambling for a single man but also being in a state of disrepair. Rather, Jonathan is told that he'd be staying in a property owned by Mundesley. However, Jonathan has no intention of being indebted in any small way to the patron and so when he reaches the village he quietly settles in the rectory. A faint rattling, as of glass bottles being moved about. He remembered the empty bottles he had seen in the pantry. There was a famous case on record of bottles being thrown about by supernatural agency. Was this a manifestation? A protest against the rectory becoming occupied again, after having stood empty for so long? Well, the poltergeist was sadly mistaken if he thought that such disturbances would drive out the present occupant. The rattling was repeated, and Jonathan decided that it was too muffled and distant to proceed from the pantry, which was immediately beneath the room in which he was. In any case, he told himself, supernatural manifestations were the last resort of the credulous. All the same, he was not quite so unperturbed as he tried to pretend. These mysterious noises in an empty house were eerie, to say the least. He felt the hair at the back of his head rising uncomfortably. Then an inhuman screech, at which he started violently. 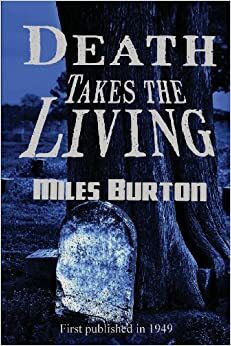 Miles Burton is one of the pseudonyms of prolific British writer, Major Cecil John Street (more famously known by another pseudonym: John Rhode). For a detailed and interesting review of this book and its author, read this informative review @ noah-stewart.com. The online link provided led me to this book for which I am most thankful. I agree with the reviewers assessment that more than the mystery and the police-procedure, it is the unstated social and cultural mores of British Society that make the novel interesting. First Line: The Right Reverend Gerald William Kinghorn, Bishop of Fencaster, sat in his study at the Palace one January afternoon. Submitted for Friday's Forgotten Books @ Pattinase & the 1949 Mystery Book Challenge @ Past Offences. Still not read anythign by him Neeru, thanks for this really enjoyed the review - must read some Rhode / Burton! I wish you'd read him soon Sergio. I have kind of rediscovered him this year. Thanks for liking the review. Thanks Margot for your kind word. I hope you read him soon. Wish this were available in an affordable reprint because I just won't read books on my computer. Spend way too much time on computers at work. Books are my escape from screens and I can read them anywhere without worrying about access to an electrical outlet or having a proper WiFi connection. :^) Anyway it sounds right up my alley. I had forgotten that Noah also reviewed this last year. Of course I had to skip about 90% of his post since he goes into much more detail than I do when I review books. There is nothing - absolutely nothing - that can match the pleasure of holding a book in your hands John. But there are so many books that are now available only in an e-format (and I am very thankful to all those sites that provide us books for download because otherwise I'd never have got a chance to read them). So it works both ways for me. Noah's review is very informative but I read it only after finishing the book as he does discuss the book in all its aspects which I quite liked because when I finish a book I want to read a review where it is discussed in detail with spoilers et al. Hope you get a copy soon as I remember your fondness for Street/Rhode. Sounds like some great reads! Thanks for the freebie heads up! Great reviews! Very nice review, neer. I don't think I have tried any books by this author and it sounds like I should. Thanks Tracy. The books I have read of this writer have not been great mysteries but I rather liked THE MOTOR RALLY MYSTERY and so am keen to read more of him. I've never heard of this author, Neer. So thanks for the intro. This sounds like a good one. I've lately been reading and rereading more vintage than ever. I love old books. Thanks Yvette for having a look. I had no idea that Miles Burton and John Rhode were one and the same till I read that informative piece by Noah. Now I am keen to read more of him. I hope you get a chance to read him soon too.